I’ve never been an Apple guy, but trying to use an old windows mobile 6.1 phone to run with and listen to podcast on was a horrible experience. A few years ago, I bought a used iPod nano 2nd gen and began using it for podcasting and Nike+ for running. Unfortunately, about a month ago the iPod took a trip through the washer and is no more. I had gone with Android for my last phone so I thought maybe give it a try instead of spending the ridiculous amount of money they want for a new apple device. I came up with Google Listen. I have to say I’ve been pretty impressed with it. I have to point out the barrier to entry is high, its probably not for someone who doesn’t know what they are doing or understands basic RSS feeds. However, I’m a developer, I live technology. I found the search for a podcast really worthless. (I’ll be using TWIT as my example through the rest of the article.) I tried searching for TWIT – This Week in Tech and I found about everything under the sun that wasn’t it. It was in the list but if you didn’t know, you weren’t finding it. Going to the podcast home page, I found, was the best way to get a RSS feed url. Feed Url’s are the driving force behind Listen. When you go to a website and view the podcast feed you are looking for it to enclose the audio file (usually an mp3) in the feed. 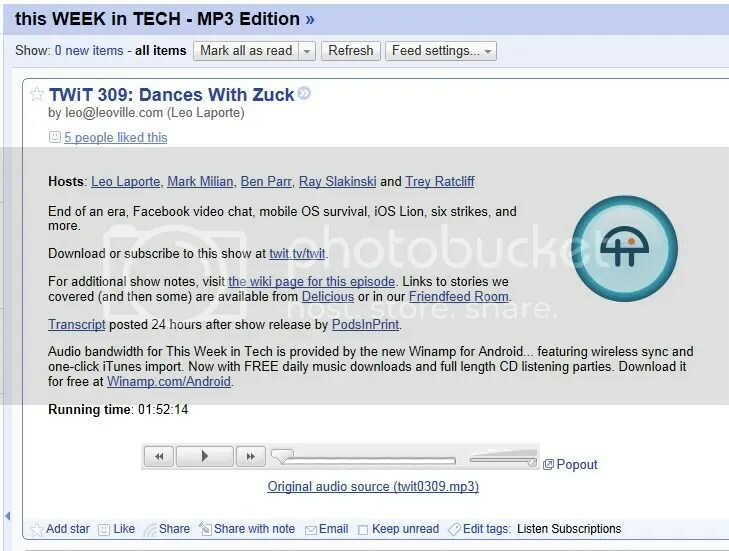 Notice my use of Google Reader, the backend sync for Listen is google reader. While it doesn’t sync your play time (meaning you can’t listen on in reader and listen or switch between and keep your place) but it give you an easy way to manage and add new feeds. Once i did, I now have a new folder available on google reader I can associate podcast feeds with for Listen specific feeds. Let’s take a peek at the dead simple interface. My listen items is anything available to listen too. 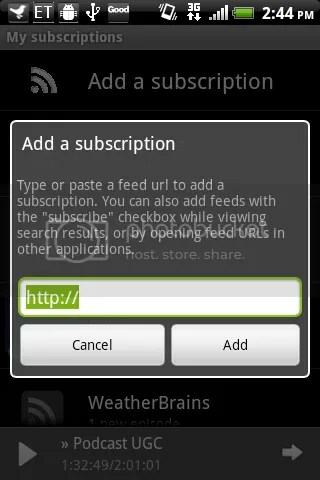 My subscriptions shows what you subscribe too. The other too are worthless to me. 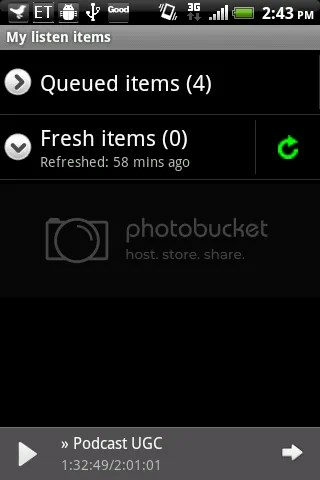 Fresh items are waiting for download or waiting to be organized in the queue. 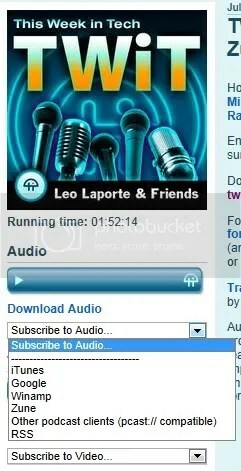 Queued items work like an ordering system to how your podcast will play (order: top to bottom). Menu and settings are pretty basic, i recommend only downloading on wi-fi though. 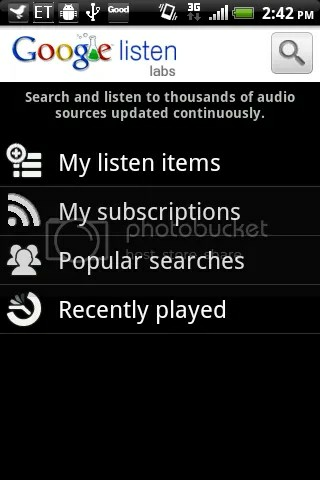 That’s it you are now enjoying your favorite Podcast/Netcast via Listen on your Android phone! Oh, and I use Endomondo to track my running now (for Android and iPhone), it’s uses the GPS instead of the shoe sensor!